More than one billion people in the developing world lack access to safe drinking water and 10,000 to 20,000 people die every day from preventable, water-related disease. The Human Right to Water argues that access to clean drinking water is a fundamental human right supported by international law, declarations, and state practices. This article has been posted with permission from the journal of Water Policy. Understanding basic human needs for water is key to ensuring a fair and sustainable supply of this crucial resource. But how much water does a person need? This seemingly simple question actually depends on many variables and cultural practices. 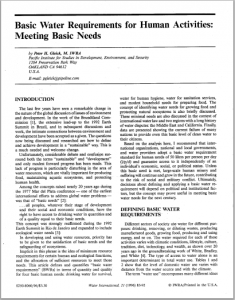 Originally published in Water International, Volume 21, the journal of the International Water Resources Association and posted with their permission, Basic Water Requirements for Human Activities: Meeting Basic Needs seeks to define a minimum basic requirement for water.